Cleaning products (2) | Shop Ethical! 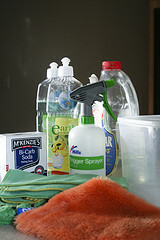 Cleaning products, unlike food or personal care products, are not required to display a complete list of ingredients. Many ingredients may cause skin, eyes and respiratory irritation, asthma, headaches and chemical burns. Others have been associated with more serious long term health concerns such as hormone disruption and neurological disorders. By reading a product’s label, you can determine how danger ous it is: the most hazardous products will be marked with ‘danger’ or ‘poison’, those that are moderately hazardous are marked with ‘warning’, and those that are least harmful are printed with ‘caution’. Fresh Green Clean is an independent Australian group that aims to research and develop green cleaning solutions, while also educating consumers on best practice approaches to environmentally-friendly cleaning. Safer Solutions is an organisation partnered with the New South Wales Government in its environmental education program. Its website contains information on safer cleaning practices and also includes a database of chemicals commonly found in commercial cleaning products. AS4351 is an Australian standard that tests the biodegradability of goods, including cleaning products. Products that claim to be biodegradable but lack AS4351 certification, or only have certain ingredients certified rather than the full product itself, should be avoided. the Environmental Working Group and Good Housekeeping have both ranked cleaning products based on how environmentally-friendly they are. choose products that voluntarily identify all of the ingredients they contain and have scientifically testable claims, such as ‘solvent-free’ and ‘no petroleum-based ingredients’. choose products that rely on plant-based ingredients, which are renewable, rather than petroleum-based ingredients, which are non-renewable. purchase products that are housed in recyclable packaging, come in concentrated doses, and are Australian-based. This cuts down on packaging and limits the greenhouse gas emissions involved in the production and travel of the products. consider avoiding the purchase of cleaning products altogether and instead make your own with common and safe ingredients – see this website for a list of alternatives.